Rural development is a key element in developing strategies to facilitate employment and create income, resulting in wider distribution of economic and industrial activities, thereby reducing rural exodus. The overall development of rural areas is of paramount importance, for any state and this can be achieved only by improving the quality and standard of life of people in rural area. The theme of the conference is a comprehensive and multidimensional concept, encompassing the development with interactions between social, cultural, environmental, technological, economical and institutional factors. The aim of the conference is to bring together Academicians, Researchers, Professionals, Executives and Practicing Engineers, from various Industries, Research Institutes and Educational bodies to share and exchange ideas and information on the theme of the conference. This conference will provide a forum to discuss various issues, new research areas, technological development and problems pertaining to various fields (social, cultural, environmental, technological, economical and institutional) for sustainable development of society. 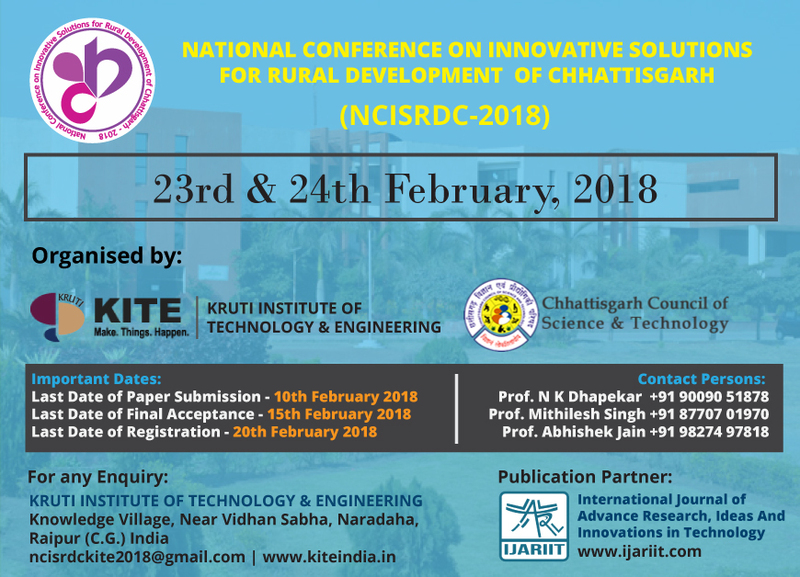 Mission of this conference is to generate implementable practical Idea, Solutions, Observation & Analysis of providing “Engineering Innovation Solutions for Rural Development of Chattisgarh” for better future. Transportation around and beneath existing cities. Environment infrastructure for population in rural areas. Water and energy infrastructure for population in rural areas. Materials and tools for rural development. Resilient building in rural areas. Emerging paradigms for rural communities. Green Technology for Power Generation. Power Quality & Soft Computing Applications. Power System Modeling Simulations & Analysis.